There have certainly been authors and works that speak to the sociological, anthropological, political, and cultural hallmarks of eras from the past century or so, but here we are offered great contemporary illustrations with intelligent text; there is much that seems to somehow have been excluded, eluded or possibly deemed unimportant in earlier tellings. The most crucial quality for a book such as Cool: Style, Sound, and Subversion is that it offers the reader context and the authors more that fulfill that need. Another aspect of the book that sets it apart from its relatives within the genre is that the authors’ representations of “cool” are viewed with eyes that stretch to an international platform rather than just focusing on the domestic or Western European movements. Lastly, in this age of the Internet, social media, ear buds and headsets, the authors provide a playlist that features music associated with or appropriate with each of the specific trends or happenings in that timeframe. This can be an amazing feature for those who do not have a broad frame of history. 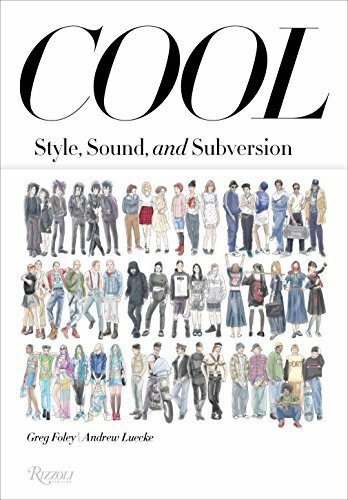 When taking all of these movements/trends/rebellions/subcultures into account, Cool: Style, Sound, and Subversion might be considered a terrific source book as well as an enjoyable easy read, no matter how informed or uninformed the reader might be. The authors proffer nuggets of information that can prove to be very enlightening and entertaining as well as just fun facts. The book provides a great history of stylistic rebellions that have occurred during the past 100 years or so in every corner of the world. It can be said that that no matter the time frame, there are clothes and ways of dressing that can define a particular decade or mood via how we present ourselves and the music that reflected those times.